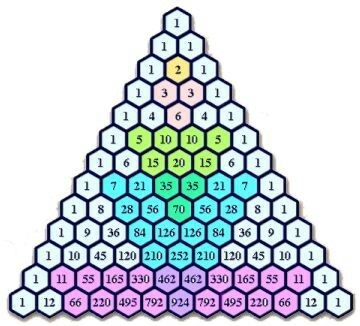 The paper I wrote with Alfonso Farina and Matteo Sedehi about the link between the Tartaglia-Pascal triangle and quantum mechanics is now online (see here). 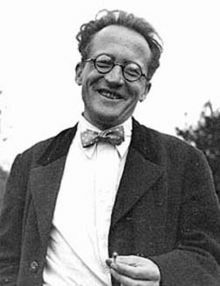 This paper contains as a statement my theorem that provides a connection between the square root of a Wiener process and the Schrödinger equation that arose a lot of interest and much criticisms by some mathematicians (see here). So, it is worthwhile to tell how all this come about. On fall 2011, Alfonso Farina called me as he had an open problem after he and his colleagues got published a paper on Signal, Image and Video Processing, a journal from Springer, where it was shown how the Tartaglia-Pascal triangle is deeply connected with diffusion and the Fourier equation. 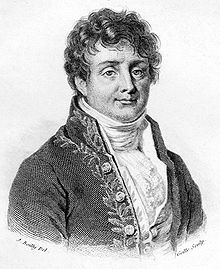 The connection comes out from the binomial coefficients, the elements of the Tartaglia-Pascal triangle, that in some limit give a Gaussian and this Gaussian, in the continuum, is the solution of the Fourier equation of heat diffusion. This entails a deep connection with stochastic processes. Stochastic processes, for most people working in the area of radar and sensors, are essential to understand how these device measure through filtering theory. But, in the historic perspective Farina & al. put their paper, they were not able to get a proper connection for the Schrödinger equation, notwithstanding they recognized there is a deep formal analogy with the Fourier equation. This was the open question: How to connect Tartaglia-Pascal triangle and Schrödinger equation? People working in quantum physics are aware of the difficulties researchers have met to link stochastic processes a la Wiener and quantum mechanics. Indeed, skepticism is the main feeling of all of us about this matter. So, the question Alfonso put forward to me was not that easy. But Alfonso & al. paper contains also a possible answer: Just start from discrete and then go back to continuum. So, the analog of the heat equation is the Schrödinger equation for a free particle and its kernel and, indeed, the evolution of a Gaussian wave-packet can be managed on the discrete and gives back the binomial coefficient. What you get in this way are the square root of binomial coefficients. So, the link with the Tartaglia-Pascal triangle is rather subtle in quantum mechanics and enters through a square root, reminiscent of the Dirac’s work and his greatest achievement, Dirac equation. This answered Alfonso’s question and in a way that was somewhat unexpected. Then, I thought that this connection could be deeper than what we had found. I tried to modify Itō calculus to consider fractional powers of a Wiener process. I posted my paper on arxiv and performed both experimental and numerical computations. All this confirms my theorem that the square root of a Wiener process has as a diffusion equation the Schrödinger equation. You can easily take the square root of a natural noise (I did it) or compute this on your preferred math software. It is just interesting that mathematicians never decided to cope with this and still claim that all this evidence does not exist, basing their claims on a theory that can be easily amended. We have just thrown a seed in the earth. This is our main work. And we feel sure that very good fruits will come out. Thank you very much Alfonso and Matteo! and turned immediately my attention to the linked paper: This one (if you have not a subscription you can find it at arxiv) by Tom Steele and Zhi-Wei Wang showing, with the technique of Padè approximants and an average method how to compute the exact mass of Higgs particle from Coleman-Weinberg mechanism arriving to estimate the ninth order contribution. This is so beacuse they need a stronger coupling with respect to the original Higgs mechanism. They reach an upper bound of 141 GeV for the mass and 0.352 for the self-coupling while they get the mass of 124 GeV for a self-coupling of 0.23. 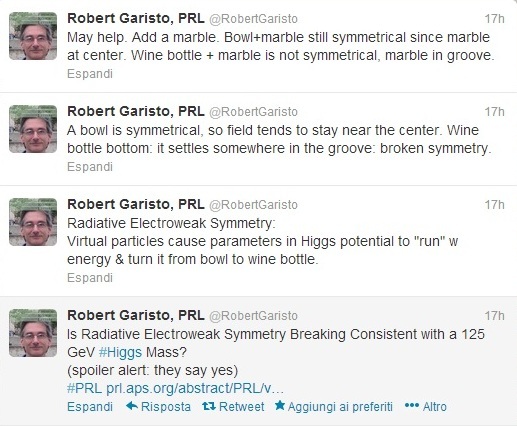 This shows unequivocally that the quadratic term, the one generating the hierarchy problem, is absolutely not needed and the Standard Model, in its conformal formulation, is able to predict the mass of the Higgs particle. Besides, the production rates are identical to the original model but differ for the production of Higgs pairs and this is where one could tell which way nature has chosen. This implies that, at the moment, one has no way to be sure this is the right solution but we have to wait till 2015 after LHC upgrade. So, once again, the precise measurements of these decay rates are essential to tell if we are coping with the original Higgs mechanism or something different or if we need two more years to answer this question. In any case, it is possible that Nobel committee has to wait yet before to take a decision. However, in the sixties that formulation was the only possible and any other solution would have been impossible to discover for the lack of knowledge. They did a great job even if we will prove a different mechanism at work as they provided credibility to the Standard Model and people could trust it. Finally, I would like to note how the value of the coupling is consistent with my recent estimation where I get 0.36 for the self-interaction. I get different production rates and I would be just curious to see how pictures from ATLAS and CMS would change comparing differently from the Standard Model in order to claim no other Higgs-like particle is seen. What we can conclude is that the conformal Standard Model is in even more better shape than before and just a single Higgs particle would be needed. An astonishing result. You are currently browsing the The Gauge Connection blog archives for April, 2013.